A large and dramatic J. B. B. 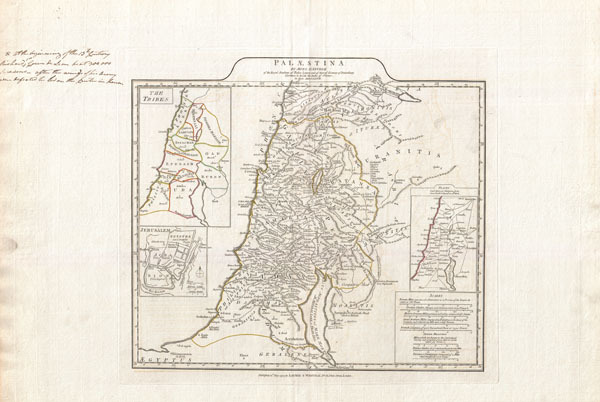 D'Anville map of Palestine, Israel, or the Holy Land. Covers from the ancient city of Sidon in modern day Lebanon south as far the city of Gaza and Egypt. Details mountains, rivers, cities, roadways, and lakes with political divisions highlighted in outline color. Features three insets. The upper left inset details the lands claimed by each of the Tribes of Israel. The lower left inset features a plan of Jerusalem as it may have looked in antiquity. Notes the Temple, Calvary, and the Mount of Olives. A further inset in the lower right quadrant shows distances between various ancient cities in the region. Title area appears in a raised zone above the map proper. Includes eight distance scales, bottom right, referencing various measurement systems common in antiquity. Text in Latin and English. In the wide margin to the left of the map is a note in manuscript concerning the activities of Richard the Lionheart during the Third Crusade. This can easily be matted out, but we found it interesting so included it in the image above. Drawn by J. B. B. D'Anville in 1762 and published in 1794 by Laurie and Whittle, London.